Language dynamics and interpersonal communication require a close examination of how participants in a communicative art negotiate meanings from shared values in the process of cross cultural communication. A transverse analysis of the situation demonstrates that there is an existence of complex efforts on connecting cultural knowledge to cross-linguistic competences alongside a widening range of communicative exchanges. This paper sets to examine some perspectives of cross-cultural communication in a multi-linguistic setting like Cameroon where many local and international languages are in close contact. The paper equally analyses the pertinence of existing macro sociological concepts as fundamental knowledge traits in literal and idiomatic cross semantic mapping. 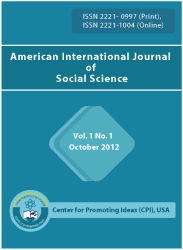 From this point, the article presents a path model of connecting sociolinguistics to the increasing adoption of a widening range of communicative genre piloted by the on-going globalisation trends with its high speed information technology machinery. By applying a cross cultural analysis frame, the paper will be contributing to a better understanding of the fundamental changes in the nature and goals of cross-cultural knowledge in pragmatics of communication and cultural accept abilities. It emphazises on the point that, in an era of increasing global interchange, a comprehensive inclusive global culture through bridging gaps in cross-cultural communication would have significant potentials to contribute to achieving global social development goals, if inadequacies in language constructs are adjusted to create avenues that intertwine with socio cultural believes, ensuring that meaningful and context bound sociolinguistic values are observed within the global arena of communication.